The number of Android apps has surpassed the 50,000 mark, and is increasing daily. With so many options, it’s difficult to know which ones are applicable to your organization and its employees. These five business programs for Android phones tout unique and useful features. Although no one plans to give up their laptop and start working full time on a cell phone, these tools could provide adequate functionality, when necessary, such as those days you’re waiting for a flight or commuting to work on the subway. This mobile office suite looks like a handy addition to a smartphone. Documents to Go for users of Microsoft Word, Excel, PowerPoint, and Adobe PDF files lets you view corresponding files on your Android device with the free version. You can view, edit, and create Word, Excel, and PowerPoint files--plus view Adobe PDF files--with the full version. This means employees and executives can make changes to a proposal, spreadsheet, or slideshow presentation at the last minute while riding the elevator to the 27th floor or grabbing a coffee at Starbucks. If you discover that your assistant has entered the wrong sales quotes on a bid sheet minutes before you enter a big meeting with clients, you can open the spreadsheet, make the change in seconds, then send the new document as an attachment to your boss before the meeting starts. With this service, you and your employees can forward all of your phones--home, work, cell, and others--to a single Google phone number, which you can manage through a Web-based application similar to Gmail; that is, Google's e-mail service. Google Voice could save companies and their customers time and effort, and it’s free for all domestic calls. International calls are charged according to a fee structure on the Google Voice Web site. What’s so great about that? Well, you can give all your clients and associates one Google number, then forward all your phones to that number. When they call, all of your phones ring, and you can answer the call on the phone in your current location. In addition, voicemails are transcribed to text and sent to your e-mail address. Other features include listening in on a voicemail before answering the phone, conference calling, call screening, call blocking annoying telemarketers, and call history. 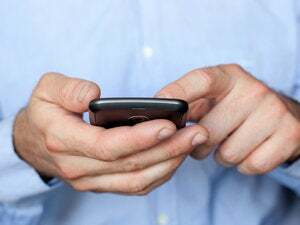 But one of the best features that could reduce mobile phone service costs is the Mobile App, which allows employees to send and receive text messages for free, without carrier charges. Check out the Google Voice site for more information about this application, including the available options for Google Voice without the Google number. Have you ever been in a meeting and needed a copy of an important document that someone else brought to the table? What about a contract, a license, or a lease agreement? Even if you had your laptop with you, it can’t scan a document or a photo. Who wants to run out to a Xerox machine in the middle of a meeting? Document Scanner scans any document or photo with your phone’s camera. You can save it, convert it to a PDF, then e-mail it or upload it to Google Docs for sharing and storage. There’s no limit to the number of pages you can scan, or to the number you can save to a memory card, except for the card’s memory capacity. And, if you’re at a conference or seminar where all the notes are posted on a whiteboard, you can just scan the whiteboard and save the notes on your phone. Where was this technology when I was in college? Some would question whether a shopping program is really a business application, and normally I would. But this program could be a time saver for companies on the lookout for the best deals on computer equipment, communications products, office supplies, office furniture, and even paper consumables. Just use your phone's camera to scan the barcode (or manually enter the barcode numbers on your keypad) of the products your office needs, such as your favorite printer, Android phone, or file cabinet. Then, ShopSavvy searches local and online vendors for the best prices. Scroll through the reviews of the products ShopSavvy recommends, and you can order directly from your smartphone. You can even create price alerts that ping you when the products go on sale. Today’s economy is global, and this affects all companies of all sizes. Unless your team includes several multilingual individuals, having a conversation with a client in French, German, or Chinese is pretty tough while holding an English to French--or German or Chinese--dictionary. One option is to try a translator application such as Talk To Me. This app uses Google Voice Recognition, Translate, and Text-to-Speech to translate among English, Spanish, French, Italian, German, Chinese, and Japanese. Just speak into the phone and the phone talks back in the selected language. No more flipping through pages of language guides, listening to French tapes in your car, sitting through Chinese classes, or investing in products such as Rosetta Stone. Talk To Me and other apps like this could soon change the definition of multilingual. See this PCWorld story for more about Android apps, visit the PCWorld AppGuide, or check the Android Market site.